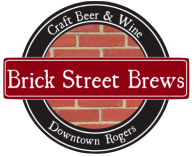 Featuring only Arkansas' finest craft beers along with fine wines from around the world. Our beer menu changes often, featuring the best brews from Apple Blossom Brewing Co., Bentonville Brewing Co., Bike Rack Brewing Co., Blue Canoe Brewing Co., Core Brewing Co., Fossil Cove Brewing, New Province Brewing Co., Saddlebock Brewery, Ozark Beer Company, Diamond Bear Brewing Co., Lost Forty Brewing, and Flyway Brewing. Fine wines include varietals from Sonoma, Napa, California, Oregon, Washington, France, Germany, Italy, New Zealand and Chile. Get comfy inside on one of the old church pews, take a stool at the bar or if the weather is fine, find a spot in the Beer Garden. Take a turn at baggo in the back, or kick-back to watch the game on the three flat-screen TVs. Local musicians are featured on Fridays and Saturdays, and or whenever there's someone willing to play.